Flights were done for a statewide color infrared (CIR) DOQQ's coverage in January-March 1998 (with followup flights for the eastern Piedmont and other areas in early 1999). 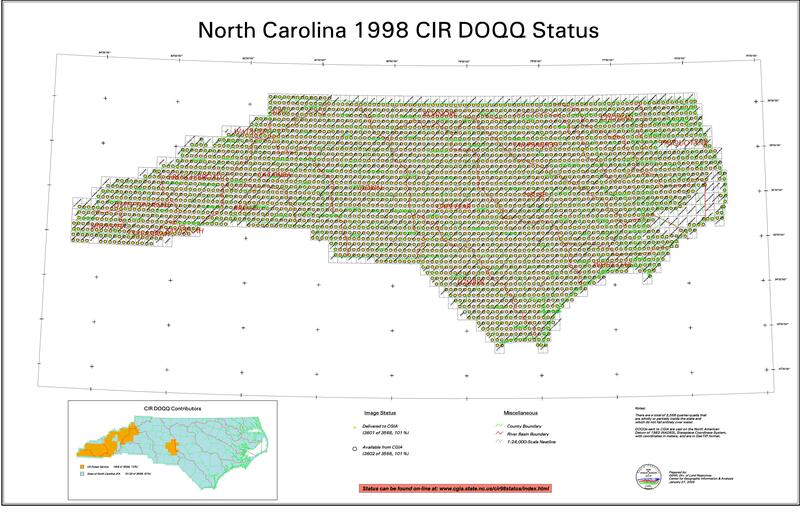 1998 CIR images are available to NCSU users for all of North Carolina from the Geodata Server at ftp://gisdata.lib.ncsu.edu/doqq/cir98/ in MrSID compression format (.sid). The images have accompanying world files (.sdw) with StatePlane 1983 meters projection coordinates. Image files are saved in folders named after the 1:100,000-scale Quadrangle Index. An index shapefile named cir_indx.shp is in /doqq/cir98 for finding file and folder names (use Quad100K attribute) for your area of interest, or you may be able to read the Status Map/Index image. An alternative download source is NC DOT, which offers public download by mosaiced tiles. CIR uncompressed GeoTIFF images (State Plane 1983 meters) are also available from NC CGIA to NCSU affiliates if you make your request through Data Services. All 3600+ North Carolina quarter quads of imagery taken over several years, but collectively referred to as 1993, are available in multiple formats and projections from various sources. The Libraries currently own USGS CD-ROM's containing JPEG compressed DOQQs for all North Carolina Counties. USGS ceased production of the County JPEG CD-ROMs, but the North Carolina Geological Survey completed production of that product and now sells county JPEG CD-ROMs for each county (see NCGS DOQQ page). The additional county CD-ROMs created by NCGS use a different header system than the USGS county CD-ROMs (see map and info). The NCGS and USGS data are available in the GIS Cabinet in the DH Hill Library reference area and may be used on the GIS workstations or borrowed by request to Data Services. Selected DOQQ's or counties may also be made FTP accessible upon request. JPEG DOQQs have 10:1 compression and are typically 5 mb in size. JPEG compression is a "lossy" compression technique which may result in a lower quality image. Quarter quads in uncompressed format are of higher quality. Network Access: Wake County and New Hanover County are currently available on the Geodata Server in /doqq/bw_jpeg/. Using USGS JPEG DOQQs: These DOQQ's use a different header and file format than the uncompressed DOQQ's. A USGS DOQQ reader extension for ArcView 3.x is available from the Minnesota Department of Natural Resource's ArcView GIS Resources WWW Page. Download the "DOQ/DRG Tools Extension" and follow the installation instructions in the PDF instructions. Load the extension into ArcView, and from the DOQQ/DRG menu choose 'Change DOQQ Source' to the directory holding the data. 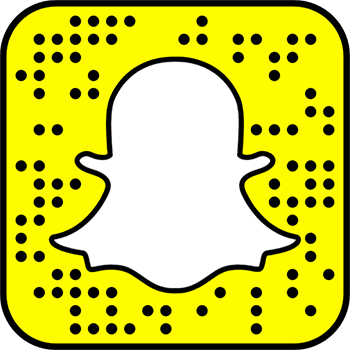 An 'Add DOQQ' button will be added to the view interface. The NC Geological Survey has provided Hints on Using DOQQ's and a set of instructions for Using the USGS County DOQQs with ArcExplorer ( a free GIS data viewer ). NCSU Libraries has the 1993 DOQQs in original BIL format. Each file is typically 50 mb in size and are on CDs in the Reference Area GIS Data Cabinet in D. H. Hill Library. They will also be made available to NCSU affiliates upon request to Data Services. A handfull of quads along the southeast border with South Carolina are only available in color infrared (about 150 mb each). To use these BIL files, in general it will be necessary to extract a header from the raw DOQQ file in order to use the data in GIS software. An Avenue script called doqcreateheader.ave is downloadable from the ArcScripts site. Before creating the header it is necessary to rename the file (the file name root is not unique without the suffix, which indicates quadrant). Some of the DOQQs obtained from the Center for Earth Observation are in .bil or .bsq format and already have accompanying header files on the CD-ROMs. Selecting Uncompressed DOQQs: An online clickable map index indicates which CD-ROM each image is on. There is also a DOQQ inventory shapefile (State Plane 1983, meters) accessible on the Geodata Server at /misc/doqqcat/doqq83m.shp.